RAH-66A was designed to have a bunch of sensors and pass data to AH-64D Apache Longbows. In order to survive on the modern battlefield and its expected air defenses, Commanche had an airframe designed to have a low radar cross section which included extensive composite structure and an angled fantail. It also had all weapons stowed internally, with bays for the missiles and a 20mm cannon that could be retracted into a fairing. Commanche also had noise and IR signature reduction measures integrated into the design. The sensor package on the RAH-66A included a modern FLIR and an optional Longbow radar system, again in a pod above the main rotor. Internal weapons bays could carry six Hellfire missiles or twelve Stinger missiles. The 20mm retractable cannon could carry up to 500 rounds, though a load of 320 rounds was projected for a normal reconnaissance mission. Optional stub wings could be mounted for carriage of additional weapons or external tanks to facilitate self-deployment. Mission profiles could include light attack, reconnaissance, and spotting for less stealthy (and presumably terrain masked or standing off) platforms like the AH-64. The Commanche ran into an number of issues. First of course was the end of the cold war. This did not kill the project outright, but it reduced the priority, lengthening the development time, and caused several reductions in the number of units ordered, driving up the unit price. Costs increased further with additional missions and equipment being added to the design, weight growth to support the new missions and gear, as well as software rewrites to integrate improved processors. With all of the problems, the US Army supported the project, at least until the war in Iraq started eating the lion’s share of the budget. The Commanche was cancelled in 2004. So what do I think? I love the thing. I really like stealth platforms, and stealth helicopters are way cool. It’s instructive that the Army only cancelled the project when they got in a severe funding crunch; the Commanche project survived the peace dividend. Plus, I’m of the opinion that integrated air defense systems are increasingly prevalent, and they’re a threat worth countering. Ukraine’s experience in the Donbass backs me up on this. Keep the XM301 or go with the M230? I’m sure someone, somewhere has a proposed LO M230. Cascadia doesn’t have a requirement for armed recce helos, let alone attack ones. But they like the extra payload of the 30mm (100 vs 238 grams). When making changes, I’d go M230 for ammo commonality with the Apaches, and because bigger payload. To make it LO, they just retracted it most of the time. Anyway, the bigger thing for us would be to get rid of the stupid “Self-Deploy” mission requirement, with the extra long range external tank configuration. Hopefully we can get weight back that way. I like the Comanche but it had technical issues as well. Ferry range, loadout and lack of a mission may have killed it if the budget didn’t. I would resurrect it in a different variant. I would expand the airframe considerably whilst keeping the shape/stealth and give it a triple T-700 engine. The AW101 triple engine setup should suffice for this. I would take the co-axial rotor and the tail assembly with pusher propeller from the SB-1 to give it speed and lift. For a main gun I would build a low recoil version of the CTA-40 with more ammo capacity than the current 30mm has on the Apache. For main armament I would have foldable bays with a capacity of around double what the Apache can currently take on it’s stubbly little wings. Lastly, transplant the avionics and targeting straight from the latest AH-64 as it’s had a lot of time to become mature. I would then aim to procure them over 20 years whilst phasing out the Apaches worldwide much as the F-35 is designed to do to 4th gen fighters. The one difference is that I wouldn’t be building three variants. There would be one heavy attack version. The reasons I like this option? Triple engine for hot and high as well as redundancy. Can run at reduced RPM for longer life. CTA-40 – Airburst, HE, AP, whatever you want. T-700 based – Can take advantage of the new engines coming online in the next few years. Large internal stores – Can take 70mm, Brimstone, AAM, SDB, Fuel and anything else. Mainly, I like the fact that a large platform designed for attack can easily be downgraded to other roles in the same way that an F-15 can do every single job because the platform is capable. The Apache has served well but there’s only so much crap you can bolt on to it and expect it to keep being successful. Notably, ITEP’s whole purpose is to expand the upgrade window for existing helos. I’ve heard from some people who may or may not be in the know that helicopter stealth is a hard problem against pulse Doppler radars, because you can’t notch them with a big rotor providing Doppler returns, the software issues which made rotors confusing were resolved in the early 1990s, and there’s only so much shaping you can do to an airfoil. At the same time, though, the Comanche project survived that, and the US has stealthy helicopters in service now, so I guess they’ve figured that one out. AFAICT, they got the ferry range working, it just upped the weight. And the Army was happy enough with the ‘stealth reconnaissance/light attack’ helicopter mission (and the design itself) to keep it around until ’04 and the desperation for monies for the Iraq war. Certainly I’m happy with it for that tasking, but reasonable minds can differ. 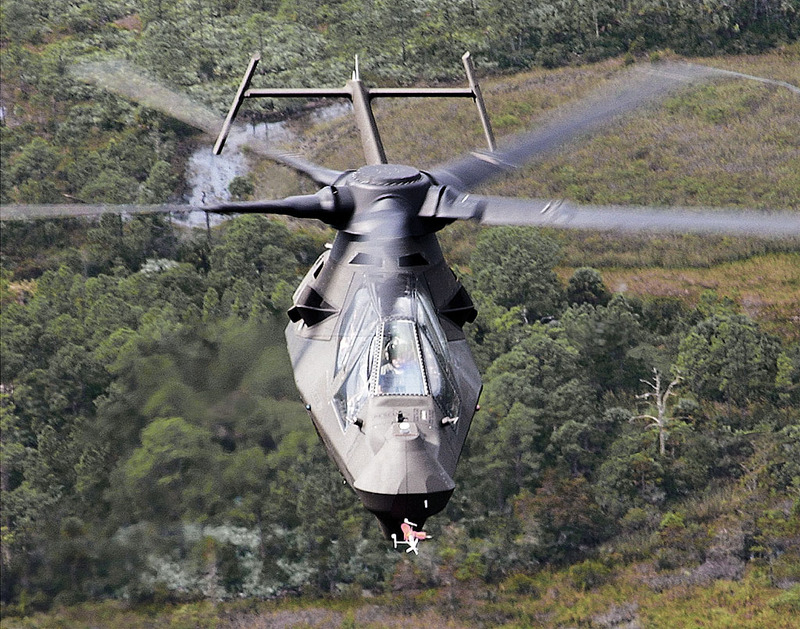 I would love a big, stealthy attack helicopter. What I don’t know, is whether it would be easier to make a ton of changes to the Commanche design, or start with something like the S-97 Raider. I might start with the Raider if you want the pusher prop config. In talking with Fishbreath, on the one hand I wouldn’t bother with a low-recoil CTA40 in a chin turret, but he thinks it might work better in a semi-fixed fuselage mount like the Ka-50 has, which already is good for way more range than the Apache (with the Russian 30x165mm). Something to think about as you’re sketching, perhaps. The bays would be cool but a pain, mostly because you have to have space for all of those missile and a way to get them out. If you look up the weapons bay ideas for the YF-23, you’ll see some of the work they went through to get a reasonable capacity launchable in a deep bay. Not a dealbreaker, but something to think about. Design sketching is a ton of fun, and I like the thoughts you have on this.